The perfect gift for Mum on any occasion! After all her hard work and love, it&apos;s always great to give something back. Large 18 inch Helium Balloon included. This bouquet includes germinis, peach avalanche roses, stallion chrysanthemums, and bouvardia all perfectly arranged and wrapped by our professional team of florists. 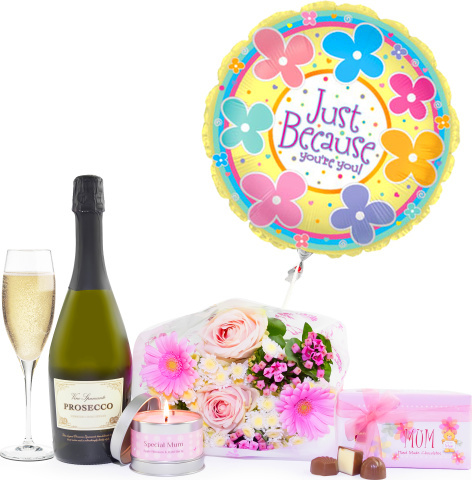 This gift is available for UK next day delivery and also includes a cheerful helium filled balloon, a 130g box of chocolates, Mum candle, and a 75cl bottle of Prosecco.